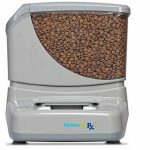 Pet Feedster Automatic Pet Feeder Review - Is It A Reliable Auto Feeder? 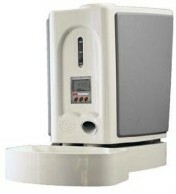 The Pet Feedster has been designed to overcome the typical problems of other automatic pet feeders. 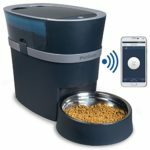 This automatic feeder allows you to adjust the size and shape of your cat kibble and you can program it up to 5 times per day, with the option of setting different amounts of food at a time for a customized intake. For example, if you want your pet to eat 4 times a day and the strongest meal to be dispensed in the morning with 1/2 cup of dry food and then one tablespoon each meal (the following 3 meals) you can do that with this unit. The range of portions goes from a tablespoon to 6 cups of kibble, which makes it suitable to feed more than one pet. This unit is ant-proof so it can be used whether indoor or outdoor. The Pet Feedster works with AC/DC power adapter and 6xD batteries as a backup so your cat won’t starve if a loss of power. With the digital timer, the unit does not need to be reprogrammed if turned off or if a loss of power. You will only need to set the clock. It works with a wide range of pellet sizes and shapes, even most semi-moist food from 1/8″ to 3/4″, (No wet or canned food). Portions go from one tablespoon up to 6 cups of kibble at a time. A digital timer that gives you accuracy in feeding times. It works with 6 D batteries to back up the unit that lasts approx. 4 months. Digital timer retains the programming if the power goes out, you don’t need to reprogram. Unit holds up to 10 pounds of dry food. Built-in mounting brackets if you need to mount the unit. The food bowl and flex-feeder are dishwasher safe on low heat. Manufacturer’s limited warranty of one year. What the Pet Feedster includes? Ask the manufacturer for the special protection cover to keep your cat away from the chute because is not provided unless asked for. (Note: you don’t need to ask the special cover if you buy the USA PF-10 for cats version, because it comes with a chute protector). Make sure to properly adjust the Flex-Feeder, otherwise, it could jam. With kibble shapes such as stars, triangles, fish, etc. try to adjust the Flex-Feeder a little wider than the shape, this way the kibble will rotate more loosely. What are the Pros and Cons of the Pet Feedster? The feeder cannot be knocked over by cats easily. Digital timer retains the programming if turned off or a loss of power. It can dispense up to 5 times a day with different portions at a time if you want. Allows you to feed your cat dry and semi-moist food. Hopper with a capacity of 10 pounds of dry food. It works with AC adapter and batteries as backup. It can be easily adjusted to a very wide range of sizes and shapes of kibbles, from 1/8″ to 3/4″. It dispenses from one tablespoon to 6 cups of kibble. Built-in mounting brackets if you want to mount the feeder. It can be setup outdoors. NOTE: Pet Feedster for cats does not have these “cons” because it comes with a special chute to prevent cats from getting extra kibbles from the opening and it has a new refined “Flex Feeder” to feed smaller kibble. The Pet Feedster is one of the best and most reliable automatic feeders in the market that works as advertised. It has several features that make this feeder unique because it allows you to feed your cat up to 5 times a day with the possibility to set different amounts of food at a time. 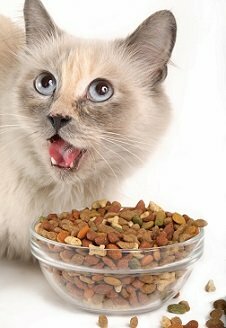 If you don’t need a feeding schedule up to 5 times a day for your cat and neither a feeder that dispenses small amounts of food at a time (one tablespoon or more) and you want a feeder below the US$100. If you don’t want to replace any piece of the feeder after years of use. You can avoid this to happen by adjusting properly the flex-feeder to the right size of kibble. (Important: The USA PF-10 CAT fixed this problem with a more refined Flex-Feeder, specially designed to feed cat kibble). CHECK THE PET FEEDSTER USA PF-10 ESPECIALLY DESIGNED FOR CATS! The cat version, Pet Feedster USA PF-10 CAT has been specially designed to feed cats! The “Flex Feeder” system has been adapted to dispense smaller pellets, according to cat’s needs. Also, there is a chute to prevent cats from trying to get extra food with their paws. I do not life in the United states so I want to know if there is a way I can buy the flex feeder online? There is a way to buy the Pet Feedster online, for example through Amazon. Update: Hey Margarita, I just noticed I did not read “Flex Feeder” and instead I read Pet Feedster, so I did not give you the right answer. You can get the Flex-Feeder directly with the manufacturer and they ship to Canada. If you adjust correctly the piece to the kibble size you might not have this issue at all. Good luck! Even though this automatic feeder is excellent, I suggest you to ask somebody to check on your cat during your trip. Good luck Fatima! Thanks so much for all the detailed info. I have ordered the Pet Feedster Cat edition from Amazon via your link. I am grateful for the advice. I’m currently living in Germany, Europe right now. Do you know by any chance if there are similar systems that are compatible with European power supply (220V, 50HZ)? I did not find any alternatives that could provide the detailed portioning the American ones can deliver. Thanks in advance for the information! Hello Kristel, I suggest you the Super Feeder which is capable to dispense small amounts of food at a time. You want to contact them directly and not purchasing online. They will tell you how to proceed. They explain details here. What a great website you have. I’m REALLY impressed with how quickly you answer questions and that you give the CONS as well as the PROS of the products. Hi Barb, thanks for your nice input. I am not sure if I understand the question, what tag are you referring about? The Pet Feedster does not need tags to work. If you refer tags attached to the cat collar for an automatic wireless feeder, I am pretty sure that all tags working in the Radio Frequency spectrum are affected by conducting materials, especially metals. So the RF tag would do fine with plastic but not with metals. Anyway, I have the impression that it would not be a good idea to put so many tags in your cat’s neck. Good luck Barb and thanks again! Sorry in advance about the lengthy post here, but I have had this unit for over 2 years so I thought I would give you my experience with it. I bought this from PoochParents.com who have since gone out of business. I got 2 defective units before finally getting the 3rd one to work correctly. The first 2 units would inexplicably RESET all the programming to factory settings (de-program the device) so that no food would dispense. Needless to say I was not happy and I let them know. To their credit I got a call from the owner of the company who told me that some of the CPU units in the devices were part of a faulty batch received from China where they were made… ok then! The 3rd unit retained its settings and performed FALWLESSLY for about 1 year. During that year, the unit really did work as advertised and we were very happy. The problem after the first year was that the plastic rotating food dispensing part that actually dispenses the food, broke. Without this small and somewhat fragile part, the unit is dead! We were able to get a replacement part, which is not easy and there is no east way to order one from their website!! With the new part installed, the unit then worked again for about another year before the same part broke again, rendering the unit useless once again. This time, no one is returning my calls or emails and it looks like I will not be receiving a replacement part. So after all this, I can either modify the unit myself by trying to fix/replace the broken part, or I can buy another unit from the same manufacturer, or I can try a different unit from a different company altogether. I will be trying the first option to modify it first, before I purchase something else from another manufacturer. I really wanted this company to do well as they could easily have had a stellar product if they addressed the failing part or even made it easy to order a replacement online, but ultimately their lack of customer service is what has now turned me away from them. Hello Chris! Thanks for sharing your experience with us. Approximately after a year the Flex Feeder piece of the Pet Feedster whether breaks or bend with the constant use if this piece is not adapted to the kibble size before using it. This part is replaceable. Now there is a new version: the Pet Feedster Special for Cats. The Flex Feeder piece in the cat version is specially designed to feed cat kibble, this means this piece does not need to be adjusted by the cat’s owner so it does not break. When units come defective which could happen with any product, the nice thing is to have a supplier that takes care of customers effectively and it seems like that that happened in your case. I am happy to know your experience during a year was great with this feeder because almost all automatic cat feeders except a few of them don’t work flawlessly like the Pet Feedster. Thanks again for sharing! How can I buy one and have it sent here to Australia? When we try to order one from Amazon, their system says they are not able to send to us. Hi John! Pet Feedster is currently fulfilling international orders individually and sending invoices through PayPal. Buyers can fill out a Google form and they’ll send them shipping rates, a PayPal invoice, etc. I have 3 outdoor cats that I would like to feed while on vacation. I also have a lot of nocturnal wildlife (raccoons opossums) that can get into just about anything that I have devised on my own. Have you had any experience in this with your feeders? Hi Ben, if you have determined raccoons and you want to place a feeder outside, you need to protect it no matter the type of feeder. You can see here a photo of a feeder placed outside with special protection. Hi Lorena, thanks for all the useful information! Do you think there’s a way to configure the Pet Feedster so that two cats can eat separately? I was thinking I could attach some more tubing to the chute so that the kibble goes into two separate bowls. Hello Ed, you could attach the PetFeedster to a Trixie Tunnel. You can see this idea here. Very useful article, thank you very much. I have two cats and I feed them about 1/2 cup of food twice a day. 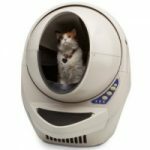 I’m looking for an automatic cat feeder because there is a weekend coming up where I’ll be out of town and I’m not sure I can get someone to swing by and watch them. I like the relability of this feeder, but the price makes things a bit difficult. What would you suggest given my situation? I like the idea of getting this because I’m covered for longer trips as well, but I’m really not sure I can afford it. Hello Yaz! the Petfeedster is one of the most reliable automatic pet feeders because it works with AC adapter and batteries in conjunction. So if the electricity fails, the batteries keep the unit operating. The Petfeedster gives you the option to customize your cat’s feeding schedule as your convenience. It dispenses up to 5 times a day, from a minimum of 1 tablespoon at a time up to 6 cups of food. If you need a feeder with a lower price you can check the Crown Majestic Diamond Series V3. If feeds up to 4 meals by day and the minimum amount is 1/4 cup at a time. Its food capacity, cat-proof design and dispensing features are not the same than the PetFeedster though ;-) Good luck! If you set it to feed four times a day does it do that continuously day after day? Can you just use batteries and not plug in? Hello Gewn! yes, the PetFeedster continuously feeds your cat everyday at the programmed times. You can use only with batteries, however, the feeder’s main power source is AC Adapter, batteries are for backup in case of power outage. I spend my winters in Florida and have 3 outside cats that need feeding during winter. They have access to garage thru cat door . unfortunately so do raccoon and possums occasionally. Just wondering if it is sturdy enough to keep them from getting at storage compartment I figure if I feed them at same time so food is gone when cats are done maybe I can discourage other animals if no food is present as long as they can’t break in storage compartment . Hello Joyce! the Pet Feedster is made from durable ABS material that ensures toughness and impact resistance. The lid is unlock twist type that requires human intelligence to unlock. If the raccoon in your area is big and stubborn he might still be able to damage the unit, but if it’s an average type of racconn he will just try for a while and then give up. Make sure to screw the chute’s protection so unwanted paws can’t access the food. Good luck! Is the food bowl attached to the unit, so the cat cannot dislodge it from under the chute? Hello Marina, the tray is removable and attached by inserting the tray into slots of the unit. It’s very firm and I highly doubt if any cat could move it from it. Check a Youtube video here and see how firm the tray is attached to the feeder.